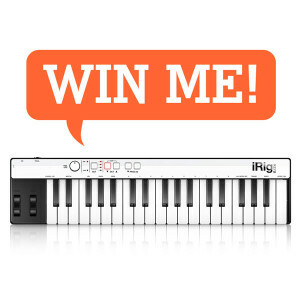 Win a free IK Multimedia iRig Keys! Enter for your chance to win a free IK Multimedia iRig Keys (a $99 value)! We’ll give you a code to share with friends to increase your chances. Each friend who signs up using your link will earn you an extra chance to win! Includes adapters for Lightning, 30-pin and USB. Fill out this form to subscribe to our newsletter. When you confirm your email, we’ll send you a sharing code to share this giveaway with your friends. Each friend who signs up using your code will earn you an extra chance to win! In our newsletter, we’ll let you know from time to time about new apps, useful resources, and future promotions like this one. We try very hard not to be annoying but if you must, you may unsubscribe at any time. However, you’ll need to be subscribed in order to receive notice if you’re the winner. Your privacy is important. By default, your information will only be used by us to contact you and it will never be shared with any third party unless you specify otherwise. Enter now. No purchase necessary. Entries will be accepted until 11:59 pm Eastern Standard Time on May 31st, 2015, and the lucky winner will be chosen and announced on June 1st. IK Multimedia, maker of the iRig Keys has provided the keyboard prize for this giveaway. Would you like to share your information with them? No. Do not share my information. Yes. Please share my information. Share responsibly. Don't spam. Only share your referral code when and where it is apropriate and welcome.